What experiences and/or circumstances do you need to accept so real, transformative change can occur in your life? I accept______________________in my life and trust that all will be well. I give myself permission to let go. Conscious acknowledgement of whatever it is, says that you’re ready to move forward; in fact, the affirmation is the start of your shift. If you need an example, let the shift in one season to another be your guide. It’s the end of summer; you can definitely feel a little bit of fall in the air and the pull to prepare for it. It’s all a part of the process of renewal. Like nature, you cannot be stagnant, and this is where acceptance is crucial and absolutely necessary. Yes, it is difficult sometimes (I’ll be the first to admit I have a hard time in this area) but when you do, it brings healing, peace of mind and an opportunity to receive something new, something better, something you didn’t even know you needed. However, you cannot receive that “something” if you’re not willing to trust the process. There’s a beautiful quote by Kris Carr that I refer to when I’m having difficulty accepting an experience or circumstance in my life: “When we truly embrace acceptance, that’s when our body exhales and can begin healing.” I’ll add that the mind and soul take a big sigh of relief, too. They, in unison, say, “Thank you.” So, take some time during this transition in seasons to really meditate on the question above and be intentional about the actions you’ll take to get there. Accept, let go and make room for change. Remember, exhale. Be self-love in action. 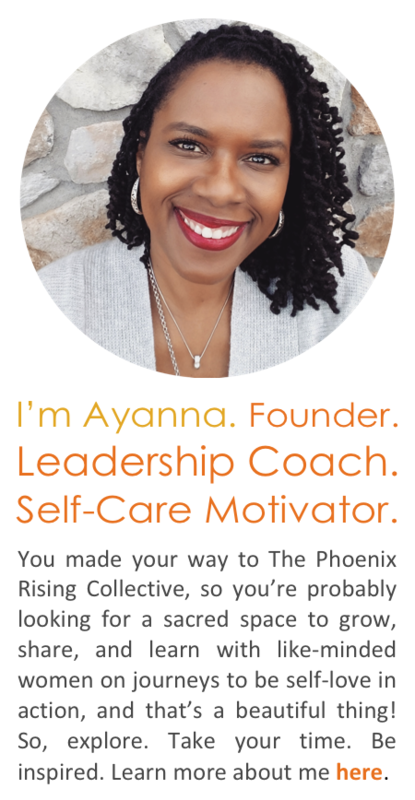 Ayanna Jordan is founder of The Phoenix Rising Collective. She develops and facilitates women-centered workshops on how putting self-love into action can transform your life. Ayanna also creates coaching and training that supports women’s professional growth in leadership, entrepreneurship, and passion-filled work. As editor-in-chief of Phoenix Shine, she is happy to be working with contributing writers to provide resources and awareness on topics that cultivate self-love and acceptance. Right now, she is most inspired by the LYFF series and She Makes It Beautiful. You can learn more about Ayanna HERE. Let’s stay connected. Join our social community on Facebook and Instagram. 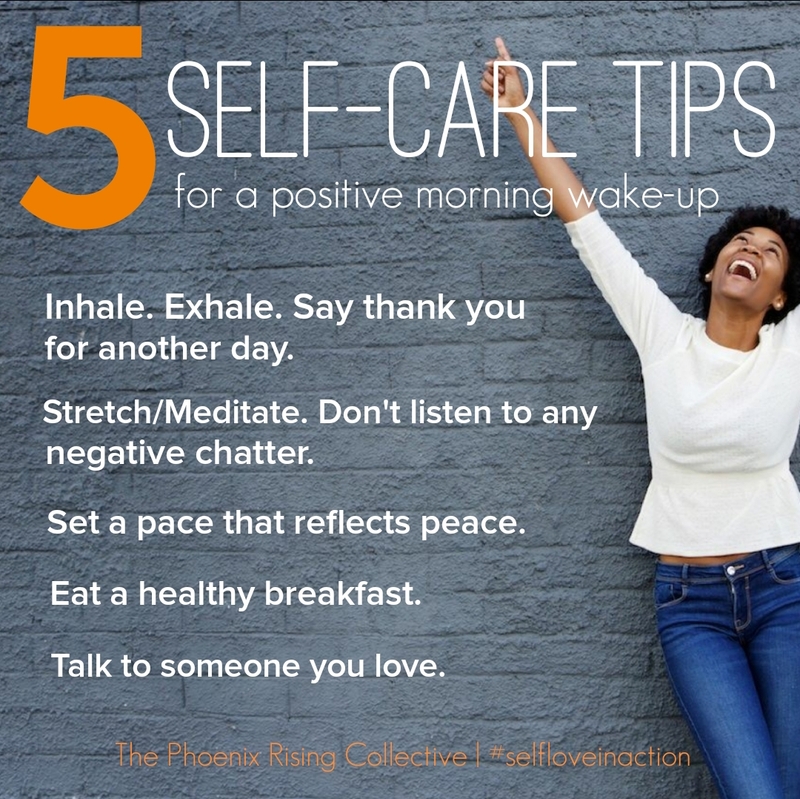 Categories: Self-Care + Personal Growth | Tags: conscious living, empowering women, how to let go, Kris Carr, personal affirmations, personal growth, self-care, self-love, the phoenix rising collective | Permalink. Love Yourself First! Friday (LYFF) is part of The PRC’s Shed Light series collection. We invite women to tell their LYFF stories to inspire and empower others to also fiercely demonstrate self-love in action. The questions are meant to “shed light” on various ways our featured Phoenixes are making self-care and intentional living a priority. Loving myself is a practice, a daily practice, a moment by moment practice mixed with a lot of patience and self-compassion. Loving myself is becoming more aware of my thoughts, my feelings, my behaviors and actions. Through this I am aware of the woman I am becoming. There is not an end product, no finished version of me to love. I am on a constant journey. Now, I’m on the right path of self-love and there’s no way I can get off. I am aware of the difference between self-hate and self-sabotage in comparison to self-love, and I don’t want to go back. It’s telling myself that I am loved. It’s about getting out of my own way to allow the love that I hold within to flow through me, to flow through my heart, body, mind and soul for myself, for others, and for the world at large. It is about being open and vulnerable, and growing in strength by giving and receiving. It means not taking on anyone else’s hang-ups while at the same time dealing with my own. Loving myself first does mean changing my narrative, changing the stories I have been telling myself and living by. I accept that within life, as I move forward attempting to become the best version of me, there will be difficulties and struggles. It will be messy and I won’t do things perfectly. Acknowledging my fears, mistakes, doubts and struggles, and sitting with them (not denying them) means loving myself enough as I am: the ‘good’, the ‘bad’ and the ‘ugly’. It means cutting myself some slack if I’m having a bad day. It’s about praising myself, as well as chastising myself, but still being able to believe in myself, always. The mind is a powerful tool if we use it as such. It controls all that we do and don’t do. It affects our thinking, feelings, actions and behaviors. It doesn’t matter how much I want to do something: go for a run, eat healthily, go to a yoga class; if my mind isn’t into it, it ain’t happening. It’s a constant practice and battle to keep my mind in the zone – focused and motivated. It gets tired, disheartened, distressed, and frustrated. My practice to ward against this happening too often is to meditate on the page. I call it my Morning Pages (thanks to Julia Cameron) or simply journaling. Every day I have to work out on the page. Each day I show up by writing out how I’m feeling, what I’m thinking, dreaming, stressing. I’m connecting with myself on the deepest of levels or even shallowest of levels when I provide the time and space to have this daily inner conversation. This writing practice is deepened by walking, running, wild swimming and eating consciously. But these other self-care practices go out the window when I’m disconnected from myself, when I haven’t been checking in with myself on a regular basis. The person I am becoming and how I present my being within the world is constantly changing. I’m inconsistent, so having the means to check in with myself keeps me sane. Self-care for my soul comes through my creativity. Creativity is my jam. Whatever medium is calling me – pen on paper, keyboard, painting, collaging, knitting, dancing, singing, cooking – I need to make things, bring things into existence that were not here before I started the process. There’s a feeling as if something, some kind of energy is flowing through me when I create. I’m in the zone. I’m working intuitively. I’m creating and am at peace. I’m joyful. This doesn’t happen every time I take the time to create, but I keep showing up in the hope that these feelings, this experience will happen again and again. It’s not about the end product; it’s the process. It’s the practice with patience, of course. There comes a time in everybody’s life when the unspeakable happens. To say it hasn’t happened or won’t happen to you is a lie. You’re kidding yourself. Believe me. In May 2015, the unspeakable happened to me. There was a public shaming. My whole world fell apart the day I was accused of being a plagiarist on Facebook by a ‘so-called’ friend and fellow poet. He wrote that he’d found whole scale “borrowings” from other writers’ words, phrases, and structures within my latest collection of poetry. He said that he was just doing his duty for the poetry community by bringing it to everyone’s attention. What followed was what I chose to call a public lynching of me as a writer, poet and person. This was the unspeakable that happened to me. But funny enough, I am speaking about it here, as well as writing a creative non-fiction book about this whole experience. Everything I knew, all I was, how I thought myself to be was taken from me in that public posting. I issued an apology regarding my unintentional mistakes and withdrew from the public realm. At one point, death looked a very promising course of action, but I had my family and some supportive friends who helped me. Within the Chakra system there is a heart center called Anahata Chakra. In Sanskrit, Anahata means “Unstruck.” For me this speaks to the resilient nature of the human heart. I believe, wholeheartedly, that there is a place within my heart that is absolutely unbreakable. This experience did break my heart, stopped me from loving, and shut me down and out. However, there was a minute part that kept pulsing, kept the light on for me. Maybe it was my belief in self, my self-love that got me through each day. Each day has not been wasted. I have taken this experience as a wake-up call, a wake-up to explore and claim my authenticity. Afterwards, I had nothing. I couldn’t even look myself in the face at one point. But writing my book and starting to take photographs of myself have supported me in my climb up. I can’t say climb ‘back’, because who or what I am becoming, I do not know. I have never met this woman. I do know that love and self-love, first and foremost, are at the center of this journey. Self-love has to come from me. Obviously, right? But it is probably the hardest thing we try to do, have to do. It is difficult, because maybe we are not given the tools to love ourselves, so we struggle to practice it. I’ve spent the majority of my life trying to please others, trying to make them like and love me. I thought this was the route to travel in order to develop self-love. I’ve spent multiple lifetimes making others comfortable at the expense of making myself uncomfortable. I just wanted to be loved. I wanted to be accepted and validated. I wanted to be enough, good enough. In the process of pleasing others I’ve silenced myself. I put versions of me into storage, buried them away. I’ve censored myself because I haven’t loved or believed in myself enough to show up in the world as me. I’ve thought,”If I’m truly myself people won’t like or love me.” They’d see my ugliness and disown me. As things have transpired, I have been disowned when I least expected it. When I thought I was accepted. Now, I’ve got nothing to lose except myself. Out of fear I disowned myself, but not anymore. This past year of reaching rock bottom meant I had nothing but myself to count on. It meant I had to go within, search within the shadows, within my darkness to find my light, to find me. And it’s source is love. I’m not here to write ‘the happy ever after’, as that just happens in fairy tales. In real life, self-love doesn’t show up every day. It isn’t a constant. Some days I feel worthless, useless and such a failure. Henry David Thoreau said, “There is no beginning too small.” This I do know. Each new day is a beginning, so if I fail this day. I can begin again the next day. Simple. I keep making small beginnings over and over again. In the process, I am learning to love myself more and more. Self-love is a practice with massive heaps of patience and compassion, but it’s worth it. No. I’m worth it. Categories: Love Yourself First! Friday | Tags: authenticity, conscious living, healthy self-esteem, healthy well-being, Love Yourself First! 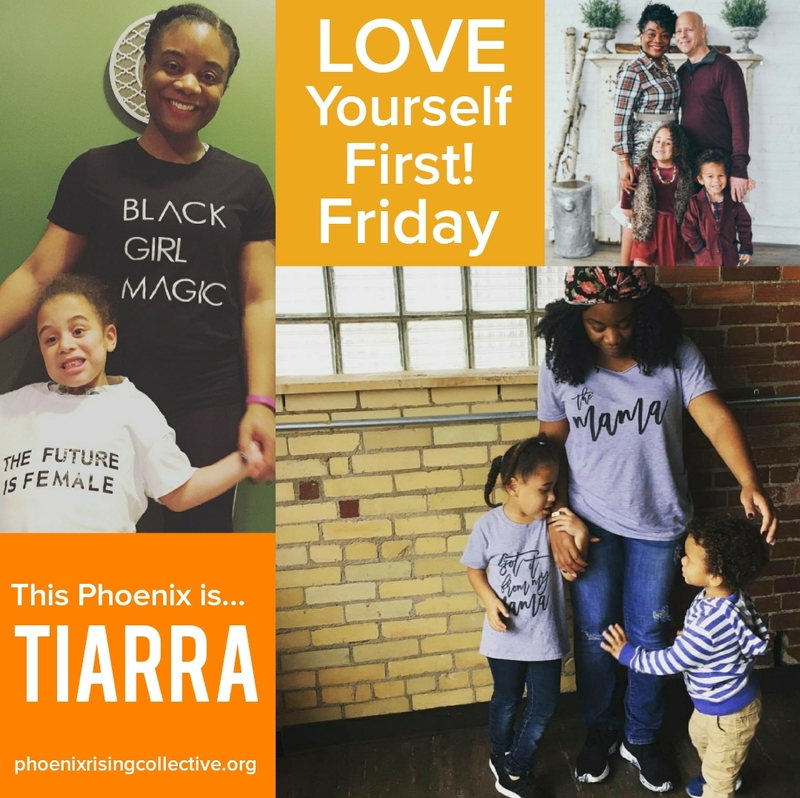 Friday, self-care, self-care practices, self-love, the phoenix rising collective, whole living, women and wellness | Permalink.